Halong bay has more than 2000 large and small islands. There are up to 1969 islets in the 1553 km2 area recognized by the Ministry of Culture and Information in 1962, of which 980 islands have names. And in the 434 km2 area recognized by Unesco as a World Heritage with 411 islands in total 775 islands have names. The names of the islands in Halong Bay are mostly longstanding, some islands were given names by the fishermen, some are named by well known people, some names have a long story attached with them. It is not too much to say that finding out about the names of the islands is also learn about the value of history , culture of Halong Bay. According to cultural researchers, studying names of the islands and associated with them are names of mountains, river mouths, docks, pools, beaches...is very interesting and meaningful. Halong Bay has been inhabited for thousands of years and as a results the names started from the old time. According to them, names of the islands in Halong Bay have 3 characteristics which are derived from the pure Vietnamese names, derived from the natural conditions and daily life and names bearing historical and cultural meanings. For the names derived from pure Vietnamese, names of the places clearly show regional characters of Quang Ninh province in general and Halong Bay in particular. If in south Vietnam there are "Vam, Cu Lao, Rach, Bung..." (local names for small islands) Halong bay has "Con, Ang, Cap..." with similar meanings. The islands with cultural and historic meanings account for less quantity however they are associated with famous historical events . Dau Go Island area is associated with narration of General Tran Hung Dao beating Mongolian invaders on Bach Dang river in 1288, where the wooden stakes were kept in the cave before the battle. Bai Tho (poem) mountain is associated with a poem composed by King Le Thanh Tong, Lord Trinh Cuong and some other poets carved on the mountain. Most recently, the Titop island was name by Uncle Ho after the former Soviet hero G Titop who visited the island in 1962. The varied names of the islands is an interesting character of halong bay, it can be considered as an intangible value in the overall culture of the Halong Bay. 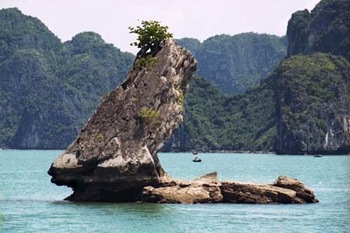 Up to now there have been many unnamed islands in Halong and Bai Tu Long bay, some islands have names however unknown origins or meaning such as Vung Vieng, Be Hen...Unfortunately, so far there has been no comprehensive systematic research about the names of the islands in Halong Bay.